Now, it’s May. I can finally breathe!!! Peak season has passed!! And I am back??? LOL but not going to lie, during the 7 months of hiatus I lost interest in kdramas and writing. But I’ve never wanted to let this go. This blog has been a part of me since 5 years ago (even though it’s saddening that my blog is taking off even though it’s been 5 years already LOL). Kdramas have been a part of me since middle school! So these two are definitely not on my “let it go, you’re a career woman already” list and I’m proud of it. Now, let’s go back to the topic. So, I am back????? Bringing you another trashy review xP. The very first review after my 7-month hiatus is Jealousy Incarnate. It took me months to finish this series. Blame my job. I used to live-watching this but as audit peak season was approaching, I didn’t have enough time to follow Show on weekly basis anymore and only managed to finished it last night. It’s been 7 months so please bear with me. My writing style has definitely changed. I forget many parts of Show that I watched before my hiatus and I don’t have enough material to make this short review to be one full review like I used to do. But I’ll definitely go back to my old full review style, and of course improve what should be improved and omit what should be omitted. Without further ado/talking, let’s start this short review. Jealousy Incarnate was one light romcom for me. It was light and fluffy and cute. The comedy totally hit home. I laughed so hard for so many times but Hwa Shin (played by Jo Jung Seok) was a total jerk all the way through which was such a turn-off. Na Ri (played by Gong Hyo Jin) was like an idiot, loving a guy who clearly didn’t like her, even saw her as someone below him. Never ever fall that type of guy, girls. I liked how Show could make me laugh hard for 5 minutes straight but wreacked my emotion the next second. I liked Pyo Na Ri and Hwa Shin bickering scenes. I lived for that! They were really funny and natural with each other. The story was really absurd at some point. Up to this day I am still questioning why Jung Won (played by Go Kyung Pyo), Na Ri, and Hwa Shin decided to live under the same roof. Like?? Why?? But the writer was clever though. S/he packaged it wittily that somehow everything was meant to happen that way. But yea, logic was missing at some scenes. The plot was moving on a rather stable pace -very stable that sometimes tended to be dragged and boring for me. There were many funny scenes though. So it kinda compensated the draggy plot. But in overall, Show was a good watch. The cinematography and editing! God, can we talk about the super cloudy filter they used on episode 1? PD-nim, it was ugly. Really ugly. But I liked the HD shots Show served us after that horrible episode. The OST list is good! Every line up was unique and easy to the ears. How the editing team cooperated the scene and the BGM was God’s work. They used very fitting BGM for every scene. Now let’s move on the the cast + acting + my impression of them. Jo Jung Seok and Gong Hyo Jin need no words. Their chemistry was off the roof. They looked natural and comfortable with each other. And the kiss! A parade of beautiful kisses what this drama is! Go Kyung Pyo, hmmm. I don’t get his hype. I think I’m seriously the only one who thinks he looked and sounded and in overall, bland throughout the show. The only episode he impressed me was episode 19. But it was also only little tiny part. Shout out to Park Ji Young, the actress who played as Bang Ja. I fell for her in episode 18. Hard. In that one particular scene where she laughed hard for few minutes but then when she saw Ppall Gang she broke into a million pieces. She made me shed tears at how desperate she looked. Her helpless character really delivered. Ah, talking about Ppal Gang, where the hell was she in the last quarter of Show? She only appeared for less than 5 minutes in the final episode. Actually, many characters in this drama were wasted. Instead of spending 95% of the plot focusing on the OTP why not give some more stories to other characters as well? A pity, really. Ok, now let me finish this trashy post. 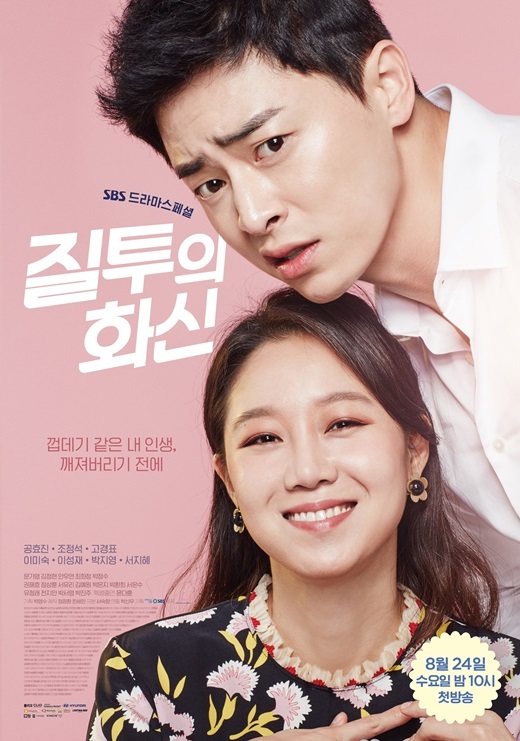 Jealousy Incarnate was a good watch as a whole if you’re looking for a romcom. With great chemistry, HD shots, and witty BGM used, Jealousy Incarnate will be a fun ride for you. One thing though, 24 episodes is too long since in my opinion Show could have ended with only 20 or even 18 episodes and there wouldn’t be any problem with the plot and everything else. Jealousy Incarnate gets a barely 7 out of 10 from me.